JOINT BASE ANDREWS, Md. (CNS) — Pope Francis arrived in the United States in late afternoon Sept. 22 to begin his first apostolic journey to America as pontiff. His plane, an Alitalia jetliner, touched down at Joint Base Andrews near Washington at 3:51 p.m. Eastern Daylight Time, nine minutes ahead of schedule. Ready to greet the pontiff as he descended from the plane, which bore U.S. and Vatican flags, were President Barack Obama, his wife, Michelle, and their two daughters, Sasha and Malia. 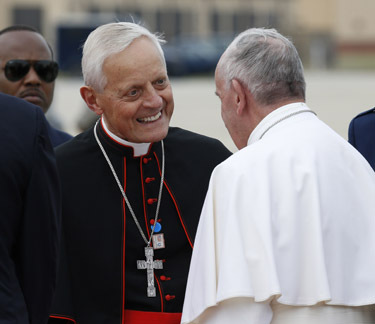 A group of bishops stood on the tarmac waiting to greet Pope Francis, among them Cardinal Donald W. Wuerl of Washington, in whose archdiocese Joint Base Andrews is located. Other prelates on hand were Archbishop Joseph E. Kurtz of Louisville, Kentucky, president of the U.S. Conference of Catholic Bishops; Cardinal Daniel N. DiNardo of Galveston-Houston, USCCB vice president; Cardinal Theodore E. McCarrick, retired archbishop of Washington; Archbishop William E. Lori of Baltimore, a former Washington auxiliary bishop; and Archbishop Timothy P. Broglio of the Washington-based Archdiocese for the Military Services. Among the elected officials at Andrews were Maryland Gov. Larry Hogan, Virginia Gov. Terry McAuliffe and Mayor Muriel Bowser of the District of Columbia. All three are Catholic. Vice President Joe Biden and his family also welcomed the pope. After the jet came to a stop, the stairway was wheeled into position and a red carpet rolled out. Thirteen minutes after the plane touched down, the door to the jet’s cabin opened. At 4:06 p.m., Pope Francis appeared from the open door to riotous cheering and applause from the small group of invitees, walking down the steps. 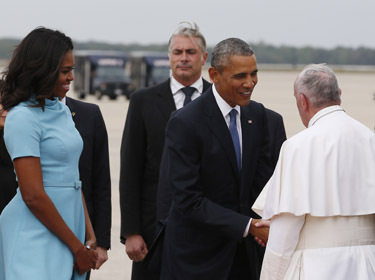 Unlike Cuban leader Raul Castro, who walked up the steps to meet the pontiff at the door of the aircraft, Obama and his family waited at the base of the steps to greet Pope Francis. The wind at times took Pope Francis’ cape and lifted it over the back of his head. At the end of the carpet, the pope met a few Catholic schoolchildren, who offered him a bouquet. The pope made no formal remarks upon his arrival. 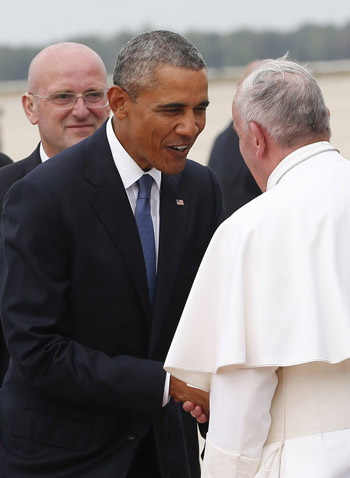 But the president and the pope chatted amiably out of microphone range, each man wearing a wide smile. 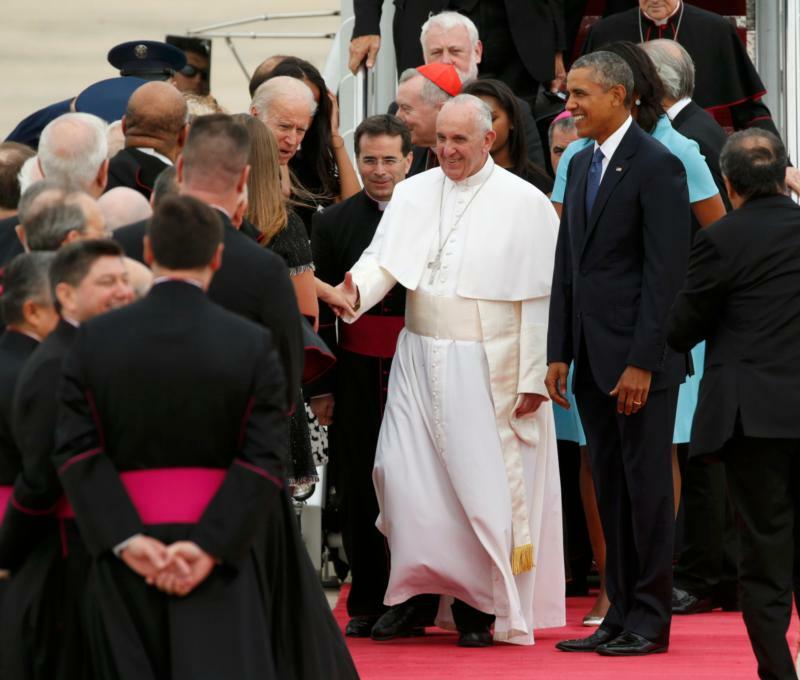 Surrounded by a Secret Service detail, Pope Francis and Obama walked off the tarmac to the grounds of the military base and into a lounge for a brief discussion. In six minutes, Pope Francis had come and gone. But after just eight minutes in the lounge, the joint papal and presidential details re-emerged, with Pope Francis receiving rock star-like adulation of the crowd on risers on the tarmac. The pope stepped into the back seat of a four-door black Fiat 500L bearing the license plate “SCV 1” — SCV being the Italian acronym for Vatican City-State — rolled down the window, and smiled at the onlookers before the vehicle slowly accelerated, trailing behind a much larger black Chevrolet Suburban. Even the glimpse of the departing pope’s hand waving from the window opposite him was enough to elicit added cheers from the crowd. 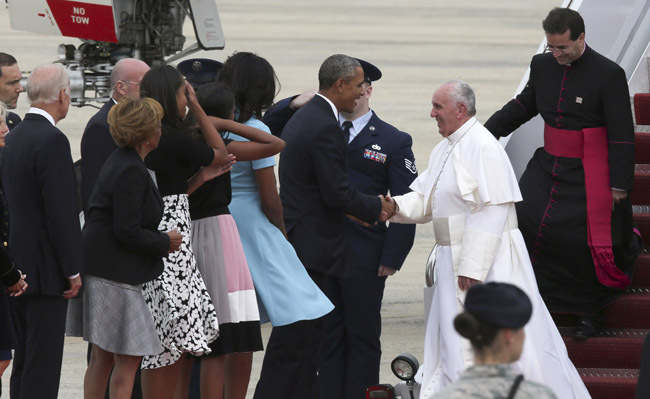 After Pope Francis had faded from view, Obama stayed on the tarmac long enough to shake the hands of the bishops who had assembled to greet the pontiff.